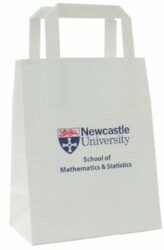 An economy version of the Twisted Paper Handles Bag. are available in Brown or White paper. The paper is slightly more lightweight and the handles are attached internally. The resulting bag and print has a traditional image. 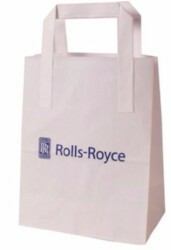 With all bags made from FSC sutainstable managed forestry stock, this is a popular choice for the environmentally aware organisation. Multi colour print and half tone detail can be accommodated. Lead Time From Artwork Approval: 2-3 Weeks. 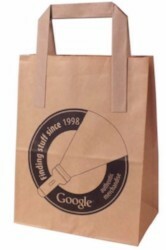 Material: Brown or White Kraft Paper. 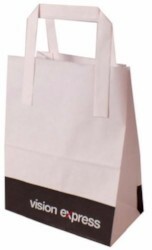 Bag Colours: 100% Ink Coverage to achieve coloured bags. Print Method: Flexographic: Spot Colour, Full Process..